NVIDIA GauGAN: Convert your painting into images! Isn’t it fantastic? The mystery behind this magic is artificial intelligence! NVIDIA has developed a deep learning model into AI system using neural network platform. Millions of photos are fed to the AI system to recreate simplistic drawings into realistic images. The system generates graphics using category of brush and drawing pattern. Interestingly, it merges the image with the nearby segment. For example, if you draw a tree, the system will not only show tree but also show its reflection in water if there is any source of water nearby! The software is multi-model, that means it creates different results for the same sketch and same settings! It runs on a Tensor computing platform. It is useful for video game players, architect and designers, people working in the training of self-driving cars to easily visualise their design ideas. 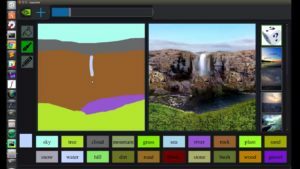 As observed in the video, it has a wide variety of categories for brushes, namely sky, tree, cloud, mountain, glass, see, river, rock, plant, sand, snow, water, hill, dirt, road, flower, stone, bush, wood, gravel, etc. The research paper based on GauGAN will be presented in an oral presentation at the CVPR conference in June. “It’s like a colouring book picture that describes where a tree is, where the sun is, where the sky is and then the neural network is able to fill in all of the detail and texture, and the reflections, shadows and colours, based on what it has learned about real images.”, said Bryan Catanzaro, vice president of applied deep learning research at NVIDIA. GauGAN is named after French post-impressionist artist Paul Gauguin. The software is in its development stage. It is anticipated that software will be made available for limited public trial in future. Did you like this article? Like us on Facebook and follow on Twitter to stay connected.